The giveaway fun as been BIG this week (have you seen the huge giveaway hop I posted on Sunday?) and continues with another fabulous prize pack! I am a HUGE snacker. I love reaching for that midday boost to get through the afternoon rush. But snacking isn’t helping my waistline. Are you looking for a way to curb your midday snacking too? How about a way to add more protein into your diet? Well, Premier Protein makes a line of delicious bars and shakes that are made to keep you fueled so you can get on with your day! Their mission is to give you the energy to get the most out of every day — now. Contest open **US** ages 18 and over. Winner has 24 hours to respond to my email titled – make sure to check your spam. Failure to respond will cause winner to forfeit the prize and a new winner will be chosen. Please note that prize can take up to 6 weeks to be received by the sponsor. No Purchase Necessary to enter. This giveaway is in no way affiliated with Facebook, Pinterest, Youtube or Twitter. One entrant per household/IP address. This disclosure is made in accordance with the FTC 10 CFR, Part 255 Guides Concerning the Use of Endorsements. Entrants must only enter with either one email address, IP address, and/or Facebook account. Anyone found violating these rules will be disqualified. It is at the sole discretion of the admin of the giveaway if the winner has met the rules or not. Only one entrant per mailing address per giveaway. Winner is subject to eligibility verification. Be sure to follow Raising Whasians via Facebook, Twitter, Google, Instagram, Pinterest and YouTube for more of your favorite family recipes, kid crafts, and giveaways! I learned they have shake variety packs. I’d like to try the DARK CHOCOLATE MINT protein bars. I’d like to try the Peanut butter crunch bar. Thanks so much. I’d love to try the Peanut Butter Crunch Bars. Thanks for the chance! I am all about that peanut butter crunch bar sounds delish.. I would like to try the Peanut Butter Crunch and Chocolate Peanut Butter first, but all the flavors sound yummy. I’d love to try the peanut lovers variety pack. I would love to try the Peanut Butter Crunch bars! Oh my goodness! The white fudge raspberry and the dark chocolate mint bars sound soooooo yummy!!! The Chocolate Caramel Fiber bar sounds awesome! I would like to try the Strawberries & Cream Shake. We love chocolate, so the Chocolate Lover’s Variety Pack sounds perfect for us! I’d like to try their 3 Pound package of Chocolate Powder. Would love to try the protein shake. It would definitely be for lunch! I’d like the Premier Protein® Vanilla Shake. I drink the Instant Breakfast ones every morning. I would love to try the peanut lovers pack! So much nutty goodness. I would like to try the Peanut Butter Caramel FIBER Bar. I’d like to try the Chocolate Shake – I’ve had a similar product, and it was tasty and filled me up. I’d definitely be interested in trying their brand, too! 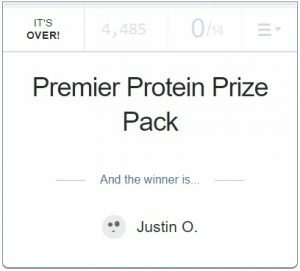 I would like to try Premier Protein® Chocolate Shake – 11 oz.. I learned f you are not absolutely satisfied with your purchase, for any reason they will replace the item or give you a refund of its purchase price. First off, I am a bar LOVER! I eat them every day but have never had this brand before! I would have to get the assortment box because I love ALL of the flavors they list. Yay! I am pretty picky too, but like all of these flvors. Energetic and are less than 200 calories. 🙂 So good snack. PEANUT LOVERS VARIETY PACK – 30g, I would love to try these bars. I would like to try the chocolate protein shake. You had me at Dark Chocolate Mint Protein Bars! Protein and staying fit is the benefit of this product line !! I would like to try their shakes. I would love to try their bars, such as their chocolate peanut butter batr. I would love to try the vanilla shake. There is 25g carbs in a white fudge raspberry bar. Thats not bad! This would be perfect as I dive into a healthier, active lifestyle. I would love to try the Vanilla protein shake! My family drinks Premier Protein drinks every day.WE love the chocolate shakes. They are great to drink after a good workout. I wanna try the chocolate mint and the chocolate peanut butter.. I also learned that It fills you up at mealtime, so you’re not reaching for unhealthy snacks in-between. It’s essential for weight control, athletic performance and overall good health. I would like to try the Chocolate Peanut Butter bars. I’d like to try the Double Chocolate Crunch Bars. Thanks. i like the peanut butter crunch bars. I’d like to try the Peanut Butter Caramel Fiber Bars. I would like to try the vanilla protien powder to add to smoothies. I would love to try their cookies ‘n cream fiber bar! It is one of my favorite flavors! I would love to try the peanut butter crunch bar! I would like to try the White Fudge Raspberry protein bars! The peanut butter crunch bars sound good! Peanut butter caramel and it gives you fiber? Now that is the way I would like to add fiber to my diet. I want to try the peanut butter crunch, we love some peanut butter in this home. The Chocolate Caramel Fiber Bar would be a great mid afternoon snack. I would love to try the Peanut Lovers Variety Pack I love anything peanut butter, cookies candy etc.. I would love to try the shake variety pack. I also learned from the site that are were suggested recipes that I would love to try. I would like to try the 30 gram vanilla protein shake. I think I would like to try the peanut butter crunch bar. would love to try the Strawberries and Cream Shake!! I love everything strawberry! I would like to try their Chocolate Powder! remier Protein® Chocolate Shake – 11 oz. First, I would love to try the Double Chocolate Crunch Bar! I’d like to try the DARK CHOCOLATE MINT protein bars to compare. I would like to give the DARK CHOCOLATE MINT bars a try. thank you! I would like to try the chocolate mint fiber bars! I would like to try the Peanut Lovers Variety Pack of bars. Would like to try the dark chocolate mint protein bars. I would love to try their Strawberry and Cream shake first. It sounds good. I would enjoy trying the Yogurt Peanut Crunch Bars. I’d like to try the vanilla shake. I would love to try the protein shakes. I would love to try the vanilla protein power, or even the chocolate for that matter! I’d like to try the PEANUT LOVERS VARIETY PACK . I want to try their new protein + fiber bars, especially the mint chocolate! The shakes sound great, too! i would like to try the chocolate caramel fiber bar! it seems like a great way to get your fiber! I liked seeing on the site the recipes, especially ones using the protein powder. I think I would love the Chocolate Lover’s Variety Pack. I’d like to try the chocolate protein powder. I hope that this doesn’t disqualify me! I absolutely love Premier Protein. Everything I have had so far is wonderful. Their peanut butter caramel bar is amazing, the calories are low, the protein is high and keeps you full. Anyone should try it. I haven’t tried their products yet. I would like to try the chocolate caramel protein bars. I think I would like the chocolate peanut butter bars, as I normally shy away from most meat dishes or products this might be a good alternative for me. I would like to try the chocolate peanut butter bar. 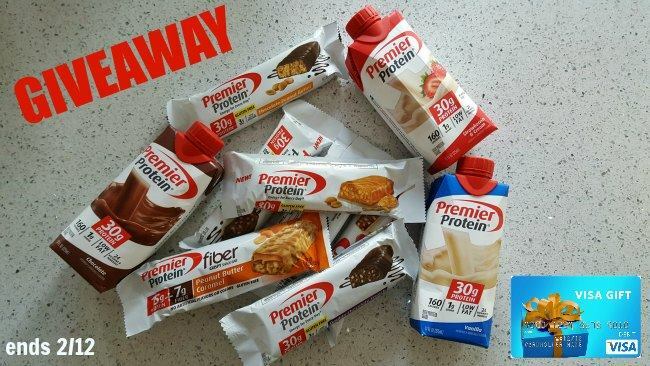 I’d also like to try the Premier Protein chocolate caramel bar! I want to try the Chocolate Shake. I would like to try the white fudge raspberry protein bar. I would like to try the peanut butter caramel bar. I would like to try the Dark Chocolate Mint protein bar. Id love to try the chocolate mint bars!! Yummo!! Love anything healthy that tastes amazing!! I’d like to try the yogurt peanut crunch bars. I learned they also sell shakes and I love those so much for breakfast. I would like to try the Vanilla Shakes. Thanks for the giveaway! I’d like to try the Premier Protein® Chocolate Shake. I’d like to try those chocolate peanut butter bars. I’ll be honest: I’m a chocolate fiend. In getting health and diet products, I always need at least some to have (or taste like) chocolate so I would probably first try the CHOCOLATE – 11 oz. Premier Protein drink. I would love to try the Dark Chocolate mint bar. Yum! I would like to try the VANILLA 14 oz SINGLE. I’d like to try the bars, especially Chocolate Peanut Butter. I am excited to try the Premier Protein® Vanilla Shake! I’d try the Chocolate Powder. Wow 30 grams of protein per scoop and no artificial flavors, colors or sweeteners. My kind of power, powder! I would love to try the Premier Protein Chocolate Shake. I LOVE Premier Protein shakes! I just picked up 3 cases of the chocolate ones and 2 boxes of the fiber snack bars. They taste great and have so few carbs! I would like to try the chocolate caramel fiber bar. Peanut Butter Crunch bar sounds nice. I would love to try the premier protein chocolate shake! I would like to try the Strawberries and Cream Shake. I would like to try the dark chocolate mint bars. Thanks. I’d like to try the peanut butter crunch bar. I would love to try the chocolate and caramel bars. Chocolate and caramel anything is awesome! I love the protein to carb ratio on the shakes! I would like to try the Yogurt Peanut Crunch Bar. I would like to try the Dark Chocolate Mint Protein Bar – the flavor combination sounds delicious! I want to try the yogurt peanut crunch bar. I like the Chocolate Peanut Butter with 0 grams of trans fat and hydrogenated oils and no high fructose corn syrup. try the DARK CHOCOLATE MINT protein bars. I would try the DARK CHOCOLATE MINT protein bars. Cookies & Cream sounds good. The dark chocolate mint bar looks SO yummy! I would like to try the Dark Chocolate Mint Protein Bars. Thanks for the chance to win this awesome giveaway! The Peanut Butter Crunch Bars sound delicious! I’d like to try the chocolate caramel fiber bar. The chocolate lovers variety pack sounds good. I want to try the Peanut Butter Crunch Bars. I would really like to try the Cookies ‘n Cream FIBER bar. I would like to try either the peanut butter crunch or the dark chocolate mint. They both look great. I would like to try the Peanut Lovers Variety Pack Bars. I’d like to try the DOUBLE CHOCOLATE CRUNCH bar! I would like to try the strawberries and cream shakes. The Premier Protein® Vanilla Shake – 11 oz. sounds real good ! I would like to try the White Fudge Raspberry protein bars! Yummy! I would love to try the Strawberries and Cream shake. the peanut butter crunch bar sounds yummy. I’d like to try the Vanilla – 11 oz protein shake. I want to try the peanut butter crunch protein bar. I would love to try their peanut butter caramel fiber bar. They have more of a selection than I knew. about. I would love to try the Peanut Butter Caramel FIBER bar. I’m in for trying the White Fudge Raspberry protein bars. The chocolate peanut butter bar sounds delicious! I love peanut butter, but the white fudge raspberry bar looks so good! I want to try the Double Chocolate Crunch bar! I would like to try the Chocolate Caramel FIBER bar best. I’d like to try the Premier Protein Vanilla Shake, Single – 14 oz. The strawberry & Crème shakes our delicious, LOVE THEM!!! If you haven’t tried them you should..
We would like to try their CHOCOLATE WHEY PROTEIN POWDER ! I learned they have chocolate caramel protein bars.